"Ronald Reagan on Suspense: Circumstantial Terror"
Ronald Wilson Reagan was the 40th President of the United States of America, with Vice-President, George H.W. Bush. He held the office from Jan 20, 1981 through Jan 20, 1989. 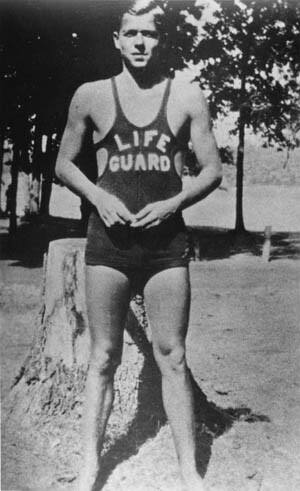 During his Presidency Reagan implemented sweeping political and economic changes, survived an assassination attempt, and ordered military action in Grenada. His second term in office is noteworthy for many foreign matters; the 1986 bombing of Libya, the Iran-Contra Affair, and most notably, the down fall of the Soviet Union and the end of the Cold War. 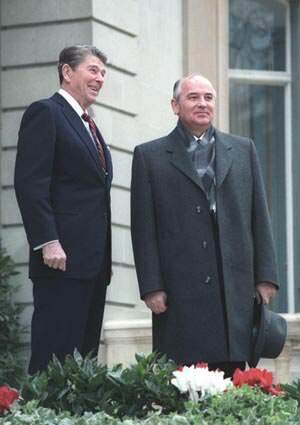 After leaving office Reagan was diagnosed with Alzheimer's disease. He passed away in 2004 at the age of 93. Ronald Reagan is the only President to have a Star on the Hollywood Walk of Fame, 6374 Hollywood Blvd. Reagan was born in Illinois. Early in life he developed and strong faith in the essential goodness of people. After graduating from Eureka College in 1932 he traveled to Iowa and landed a job announcing home Iowa Hawkeyes football games on the radio. Other radio jobs followed, including as announcer for the Chicago Cubs, specializing in play-by-play announcing games the station received by wire. 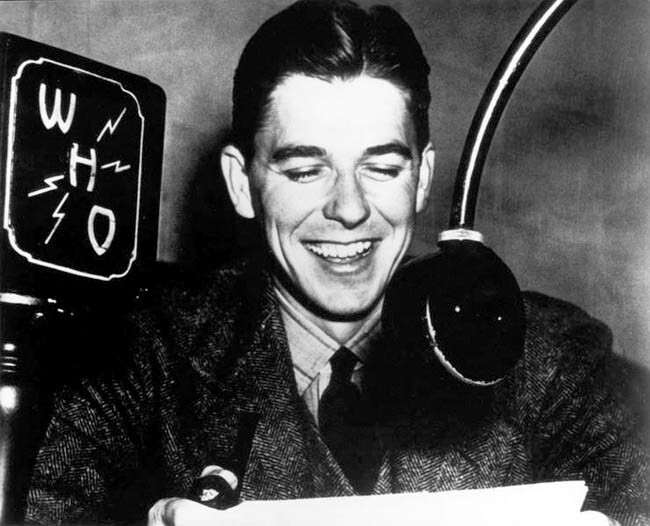 Traveling to California with the Cubs, Reagan was given a screen test in 1937 and landed a contract with Warner Brothers, working mostly in the B-film unit. Reagan is fondly remembered for his role as George "The Gipper" Gipp in 1940's Knute Rockne, All American. His role in 1942's King's Row "made me a star." Reagan played a double amputee who gives the line "Where's the rest of me? ", which would be the title of his 1965 autobiography. Unfortunately, with WWII, Reagan was not able to capitalize on the starring moment. After the War Reagan became President of the Screen Actor's Guild, guiding the union through the Taft-Hartley Act, the House UnAmerican Activities Hearings, and the Hollywood Blacklist period. 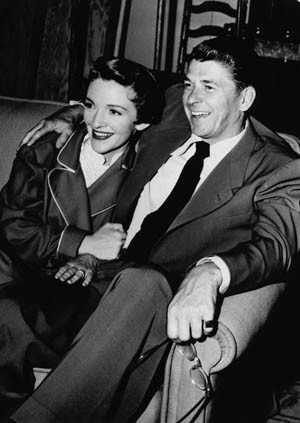 It was through the Blacklist Scandal that Reagan met his second wife, Nancy Davis (Davis' name mistakenly appeared on a Blacklist, and she sought Reagan's help correcting the slip-up.) Reagan was hired as host of TV's General Electric Theater. Part of his contract required him to tour GE plants 16 weeks of the year, often making as many as 16 speeches a day. He would often talk about his conservative ideals. GE Theater was his last job in the Entertainment Industry. Impressed with his political views and charisma, California Republicans encouraged Reagan to run for Governor in 1966, and he held the post until 1975. In 1976 he challenged the incumbency of Gerald Ford for the Republican Presidential nomination, but was defeated at the convention. In 1980 he won the nomination and defeated Jimmy Carter in the general election during a time of growing domestic concerns and the Iran Hostage Crisis. During his inaugural address the hostages were freed from the U.S. Embassy in Tehran. This collection celebrates not only the Presidency of the Great Communicator, but the show biz career of a great entertainer. Included are movie related appearances on Lux Radio Theater and Screen Guild Theater. Reagan returns to his Sports Caster roots as he takes over for the vacationing host of Bill Stern's Sports Reel. Suspense takes advantage of Reagan's dramatic sensibilities. Part of the reason Reagan was such a beloved President was that he was able to maintain a sense of humor in most situations. This is heard in many of later speeches, as well as appearances on Bing Crosby and The Burns and Allen Show. Reagan's public career is well represented here as well, from the beginning of his political presence in the "Time for Choosing" speech through the 1992 Republican National Convention. The collection closes with coverage of Ronald Reagan's funeral service in June of 2004. Be the first to comment on "Ronald Reagan"